DID YOU HAVE A LIFE RAFT? No. There is a truth that is often fervently put forth regarding saving your life in case of a disaster at sea: it says: 'stay with the largest floating object'. Seems simple, but many lives have been lost not following that principle. In my case, the beauty was that I was aboard an unsinkable catamaran - you could literally cut the boat apart and every part of the hull would float! So in this case, that 'largest floating object' would be the boat itself. The life-raft with that seductive name 'life' is but a trap-in-waiting, waiting for the panicked, the unthinking, to leave the safety of the still floating boat, albeit half submerged, and dive head first into the trap, entrusting their lives to a thin piece of plastic with barely 1/8 of an inch separating themselves from the massive ocean below. Now it needs to be said that with a monohull its different kettle of fish. Monohulls have 20-30 thousand pounds of lead holding them upright. In the case of a holing, that same heavy appendage underneath becomes a partner with gravity and together, will quickly pull the boat down to the bottom. With no other option at hand, yes by all means jump into a 'life' raft. 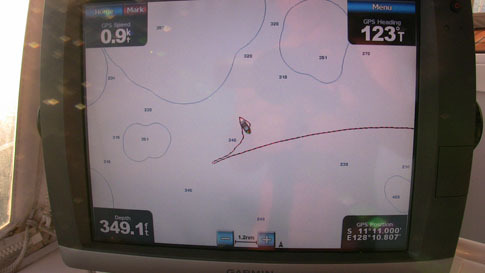 An example: on the trip between Mauritius and S Africa in the Indian Ocean, a monohull "WIZARD" directly in front of me and of about the same length as Shearwater, hit a shipping container - in short order, it was at the bottom of the sea. All five were rescued by a passing ship. And guess what? They were in a life raft! In this case, the life raft itself became the largest floating object as the boat was gone. 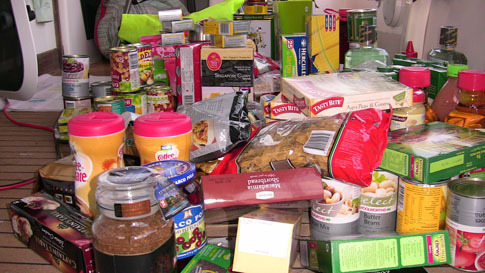 EATING: HOW DID YOU SURVIVE FOR THOSE LONG OCEAN PASSAGES? Its very easy nowadays. 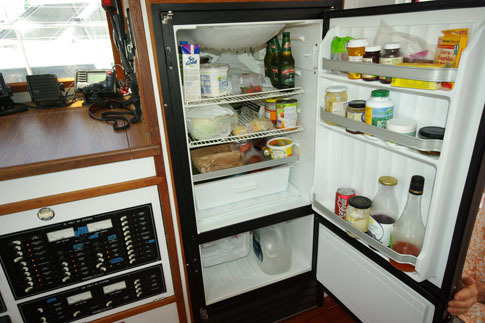 With much improved marine refrigeration, one can keep fresh produce for many weeks and even frozen things. Much as I would like to say how difficult it was, surviving on can after can of tasteless baked beans, with nary a fresh vegetable to be had...alas, the truth was quite different. SLEEPING: HOW DID YOU STEER, KEEP WATCH AND SLEEP, ALL AT THE SAME TIME? Now that was something that greatly concerned me as I first set out across the Pacific. How would I react to a very disturbed sleep pattern brought about by those hourly checks upon the horizon for nasty big ships to hit. Well once again, the answer was very pleasing: RADAR! Shearwater had a very good, high definition machine. So, quite simply, when I wanted to sleep, day or night, I would simply turn the radar on, set a safety zone around Shearwater, anything from 1 mile to 20 and.... go to sleep. Any object entering that safety zone would activate the radar and a VERY loud alarm would awake me from my slumber...simple as that. Once, you trust this silent crew...it works very well indeed! And as to steering, I had two excellent AUTOPILOTS!. These are contraptions that will keep the boat on any course you set....they are in effect tied to the compasses on board and to the steering systems of the boat. These wonderful autopilots steered the boat 90% of the time, day and night around the world. CAN YOU ANCHOR OUT THERE TO TAKE A REST? No. Because the ocean can be many miles deep and, I had barely 180 feet of anchor line, any thought of anchoring...well you get the picture. So, one has to keep going, 24 hours a day, every day. And when there was little or no wind, one either drifted with all sails down or turned on the engine at the lowest RPM's (to save fuel), just enough to keep forward momentum and the autopilots entertained. WHAT WAS THE WORST NIGHT/DAY? Ah I remember it well - a long night. One might think that it would have been somewhere out in mid ocean...but not at all....instead it was quite near land, actually, land on both sides and that was the problem. 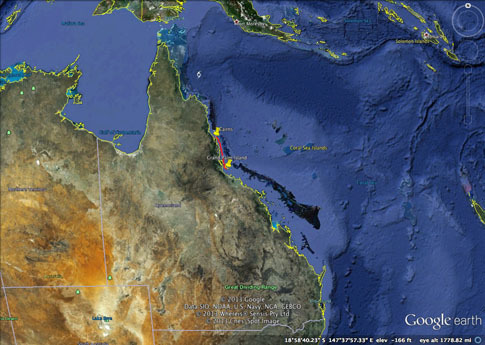 It was in the narrow passage running north/south between the Great Barrier Reef and the east coast of Australia, a passage that is used heavily by the big tankers and... reefs everywhere. One must NOT end up navigating that channel at night - its simply too perilous in the best of circumstances but to do it singlehanded in a small vessel? Totally fraught. And... thats exactly what happened. 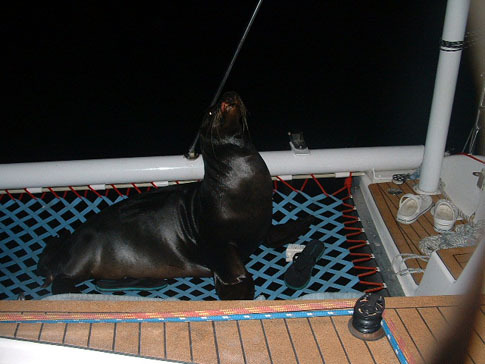 That night, unable to anchor because of heavy winds, the worst did indeed come to the worst. There I was....doing the unimaginable... in driving rain, heavy winds, no visibility, tanker traffic everywhere, navigating entirely by instruments, eight hours at the helm, non stop. I have to admit, I did not think I was going to make it and that the voyage was going to end that night - in anything but a peaceful way. 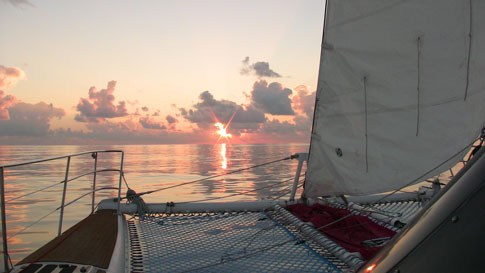 However, the morning did finally come and I pulled into the harbor in Cairns after my worst night at sea. WHAT WAS THE BEST NIGHT/DAY? That was in the Arafura Sea on the North coast of Australia, on a glisteningly calm surface, not a stitch of wind, all sails down. I reveled in the calm, the utter silence...the serene beauty... for three whole days. DOES SHEARWATER HAVE ANY ENGINES? 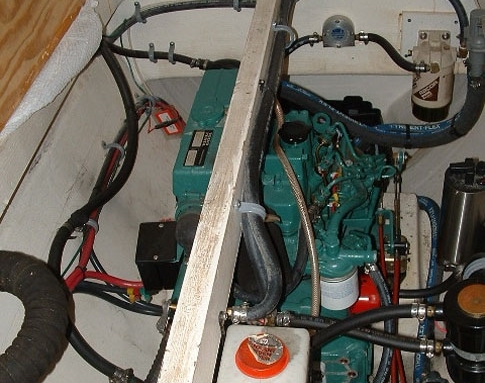 Yes, she has two Volvo 30 horsepower engines, one in each hull. DID YOU CARRY LARGE AMOUNTS OF WATER? No. Modern technology has allowed a great luxury on that front. Shearwater, like many boats today, has a watermaker on board, a neat machine that takes the sea water that abounds all around and changes it into fresh water at the rate of 8 gallons an hour! Very lovely tasting water with no limit on showers!! DID YOU MEET ANY PIRATES OUT THERE? No, thank God. However, we were all on edge as piracy was rampant during the time I was crossing the Indian Ocean. There were times when I thought I was being pursued but it turned out not to be the case - fishermen. It needs to be said that because of the piracy off the coast of Somalia, virtually no small boats are taking the Red Sea/Suez Canal route into the Mediteranean but instead are braving the treacherous passage around the southern tip of Africa. HOW DID YOU KEEP IN COMMUNICATION WITH THE WORLD? There is a neat radio called a Single-Side-Band Radio(SSB) that will allow you to talk with people thousands of miles away, who also have this radio. It bounces radio waves out of our atmosphere into the stratosphere and back and in some miraculous way finds its way to the desired radio. So...before long passages, we would set up "nets" with all those boats undertaking that particular passage at approximately the same time. The boats could be separated by anything from 200 miles to 1000 miles. Usually twice a day we would check in at prearranged times, give one's position and deal with any emergencies. If a boat failed to check in, then there would be a maximum of 12 hours since the last known position and a rescue could more easily be undertaken. 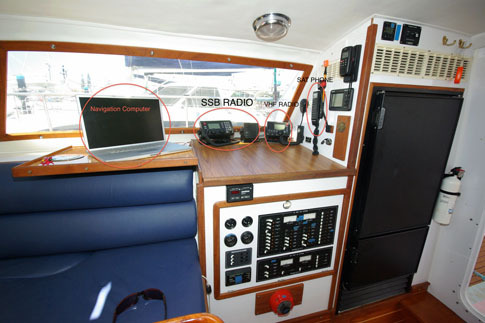 Additionally, utilizsing this same 1940's technology and SSB radio, one could receive text e- mails. A shining example: Lesley, my faithful sister, wrote twice a day amassing nearly 2000 e mails! And then there was the daily Satellite phone-call to my sister to give her my position and an 'all wells' notice. DID YOU MEET ANY WHALES? Yes, twice. The first time was off Palmerston Island in the middle of the Pacific when a mother and baby came to see the 4 boats moored off the island. 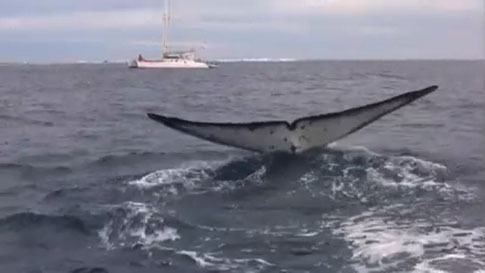 The second was a magical visit in the middle of the Indian Ocean in the black of night and underway, when a whale placed herself between the two hulls and swam with Shearwater for well over an hour. Yes! My favorite creature for its curiousity, its comic nature and its integration with humanity, nay, its dominance over humanity was the Galapagos Sea Lion. Watch the tribute to this amusing creature by clicking on the "GALAPAGOS" icon at top of the screen. WHY DID YOU GO AROUND THE WORLD? Hmmm.....hard question. I think it was always in my blood. I spent 18 endless summers on the water on Cape Cod. In fact I was reminded bya long time friend from those watery days that when I was 9 or 10 years old, I had told her: 'one day I will go around the world on a boat and you will be my first mate'. So I guess the germ sat in me all those years. DID YOU PLAN ON GOING ALONE? No, in fact, I had planned on going with crew but because of some interesting experiences with crew on the way to S America, I decided to go it alone. No...well.....yes.... let me explain. I wouldnt do it in the same way, that is alone. I could conceive of doing it again but this time with the goal of a totally different experience - an experience to be shared with someone. Doing it alone, it is objective driven experience, but with someone else it ....well as the old cliche goes: 'one can stop to smell the roses'. DID MANGO GO AROUND THE WORLD WITH YOU? I wish he had. The great dog made a valiant effort coming with me all the way to S. America. But, it was clear that for a large part of that time he lived in terror. Its a noisy place out there with high winds and waves buffeting the boat. 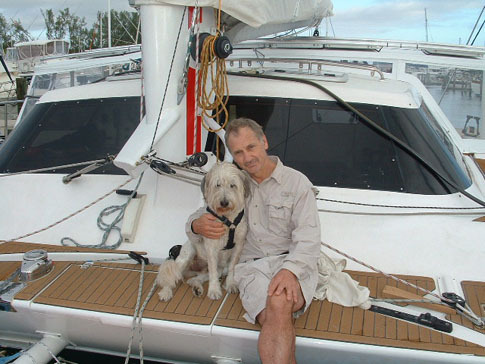 So, before I crossed the Pacific, I flew him home to Vermont where he spent a lovely 3 years with my sister Lesley and 3 female standard poodles.....much better than a boat! This was a surprise to me. In the many months crossing vast expanses of ocean, I never felt lonely. However, as soon as I entered a harbor and found myself alone amongst the many boats, all with families and friends, running hither and yon....then I felt loneliness. Its the "new york christmas syndrome" - most suicides in New York occur at Christmas time - 'alone in a crowd'. 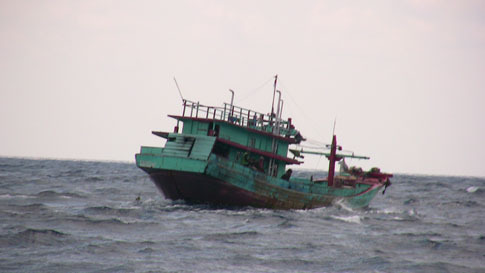 IF YOUR BOAT ENDED UPSIDE DOWN IN THE MIDDLE OF THE OCEAN WHAT WOULD HAVE BEEN YOUR LAST RESORT? 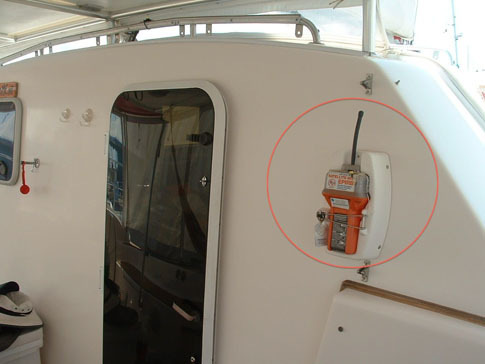 The last resort on most boats is a thing called an EPIRB - "Emergency Position Indicating Radio Beacon". Its about the size of a small shoebox and is either activated manually or, as soon as it comes in contact with the ocean, it is automatically activated. It then sends a signal for the next 48 hours to a satellite with your exact coordinates and is accurate to within 50 feet. The various coast guards around the world monitor this signal and will then coordinate a rescue, usually by diverting a tanker to your position. Shearwater has been sold to an englishman by the name of Geoff Conroy. I understand she is on the east coast of the USA sporting a lovely new main-sail. I hear there are some thoughts as to another major voyage for her.